K1ngMars on Is Steel Heavier Than Feathers? Now the deck is really complete! Keep up the good work Arkheid! What about some tutors for Sunforger ? I think this would really go a long way into improving the reliability of your wincons. Enlightened Tutor can both grab Sunforger and Smothering Tithe ! On the other hand Khorvath's Fury , Collective Defiance , Chandra Ablaze and Chandra, Flamecaller don't let you always draw 7 cards, but can be useful in letting you dump bad hands. A question. Why do you have Twinflame ? 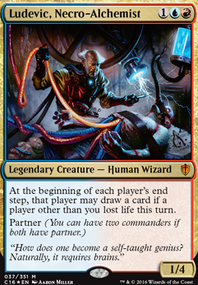 It doesn't seem to be a good card in this deck, as copying your commander, albeit rebuying you the spell, is then shut down by the Legend Rule, thus having you sacrifice one of the two between original or copy of Feather as a state-base action. I would kindly advise Hall of the Bandit Lord , as it allows for very good plays you otherwise would miss: its only problem is that it can work only if you are casting for the second time or more your commander and use its mana for commander tax. 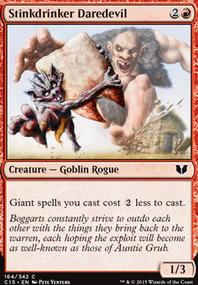 On the other hand, I would also suggest Lightning Greaves , as you could cast all your instants on the commander and at last equip the Greaves: it can be more of a nonbo than anything else, as it also cuts off combat tricks you could cast and is not removable from the commander unless you control another creature. You have a low creature count, so IDK, maybe not worth including. I would swap out Bandage , Niveous Wisps and Guided Strike for Panic , Invigorated Rampage and Adamant Will . At last, one kindof good card for ramp in not green: Explorer's Scope . 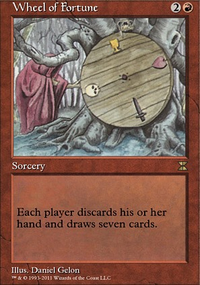 I'm thinking Wheel of Fate is really good here, suspend it and when it's time to cast it, cast all those instant spells and they will all go back to your hand on your next turn. Reforge the Soul - Pitch the bad, hope for good. Wheel of Fate - Takes some setting up because of the delay, but if you don't mind the risk it's worth it. Wheel of Fortune - Pricy, but if you can get your hands on it, there isn't much better. Runehorn Hellkite - A beater with upside once it dies. Hunter's Insight - Cast it on any unblocked creature for a decent amount of draw in most cases. Sylvan Library - At worst it's a scry. Fun little Hallar, the Firefletcher combo: Paradox Engine + Cloudstone Curio + 2 creatures with kicker you're able to pay for with non-land mana sources creates a loop for infinite damage with your commander. Would recommend Dack Fayden , Arcane Denial , Force of Will , Counterbalance , Mana Drain , Rhystic Study , Pact of Negation , Dig Through Time , Slight of Hand, Faithless Looting , Ad Nauseam , Yawgmoth's Will , Windfall , Wheel of Fortune , Wheel of Fate , Gush , Isochron Scepter , Stifle , and Damnation . I would caution going down a Wheel of Fortune route. I've never played Wheel of Fortune specifically, but Dragon Mage I've tested. Sometimes, depending on the array of commanders your up against, when I finally get a Kaalia of the Vast resolved, and either Haste/Protected where opponents can't deal with her, I definitely don't want to put 7 cards in my hand, and then put 21 possible solutions for Kaalia of the Vast in others hands. Also, assuming I'm tutoring my win-con, Buried Alive , Reanimate , etc. 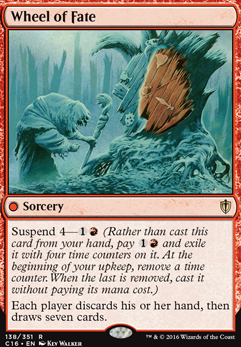 the Wheel of Fortune becomes useless to me because I have no way to recover those cards (Except Yawgmoth's Will ) from the graveyard, and I've spent mana and life to get them into my hand. Giving your opponent the solution to controlling you mostly won't help you, some situations, sure, but mostly no. 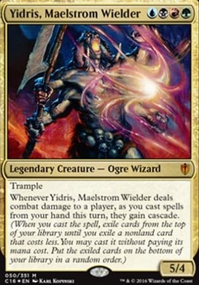 If you build around the graveyard recursion, it would be viable, or go down a Liliana's Caress type structure where draw/discard costs players life, or you control their graveyards with Leyline of the Void type effects, I think they would be good, there's many of those, like Magus of the Wheel , Reforge the Soul , Wheel of Fate . 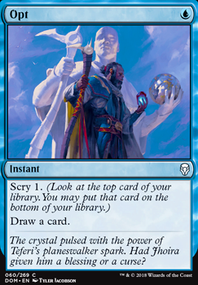 If your looking to disrupt other players by making them discard their tutor results, your probably getting Force of Will on your Wheel of Fortune anyway. So not enough synergy with it, definitely don't like reloading opponents hands and handing them a solution to whatever I'm doing, like here's 21 chances at a solution for Iona, Shield of Emeria you can't deal with, or solution for Avacyn, Angel of Hope , or solution for Kaalia of the Vast + Lightning Greaves for example. Faithless Looting is better because you control the discard, keep the combo pieces, and gets combo pieces you've accidentally drawn into the graveyard. Yesterday I did cast Restoration Angel Flash, blocked an attacking Dark Confidant and then on my turn Buried Alive ( Kiki-Jiki, Mirror Breaker , Karmic Guide , and Razaketh, the Foulblooded ) then Reanimate for the win. There was an Executioner's Capsule in play, but Breya, Etherium Shaper tapped out and couldn't activate, so took my shot. Deadman5six you don't have that many options to replace wheel of fortune.. Thats the whole problem. I think your best options that are not on a creature are Reforge the Soul or Wheel of Fate and then I would still prefer Reforge the Soul over the wheel that everyone sees coming. Spirit of the Labyrinth and Burning Inquiry , maaaaybe Wheel of Fate to go with the semi notion thief shenanigans.